The rapid opening and closing action of high-speed doors from Maxiflex help to keep birds out of facilities like factories and warehouses, consequently saving end-users substantial costs as well as reducing health risks and increasing productivity by promoting a safer and more comfortable working environment. 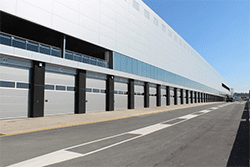 Any large production, processing or storage facility normally has loading docks or large entry and exit points that provide the perfect portals for the escape of internally controlled hot or cold air and the admission of wind, dust, insects and birds. “Our high-speed doors form a barrier that separates the internal and external environment,” says Maxiflex Managing Director, Bram Janssen. 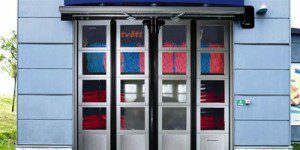 A range of superior quality, rugged automated door solutions, engineered to meet increased safety, efficiency and productivity on mines, are available from South Africa’s leading door and loading dock specialist, Maxiflex. The original door system at the automotive company’s class 4 laser cabin was proving to be slow and costly. Frequent downtime ensuing from long service periods, regular breakdowns and complicated maintenance was compounded by the fact that the door caused damage to its own structure and apron. In 2013 Maxiflex was appointed sole Sub Saharan distributor of the Crawford overhead sectional door portfolio which forms part of ASSA ABLOY Entrance Systems. Door and loading dock equipment specialist, Maxiflex, secured the order to supply and install three stylish fully glazed overhead sectional glass door systems to complement the brand new elegant showroom of premium brand vehicle dealership, Jaguar Land Rover Waterford, in Johannesburg’s Northern suburb of Fourways. For optimum performance and to extend the life of your car, it is recommended to have routine services done and change parts when required. The same practice should be applied with automated doors. If you require your entrance systems to be safe and work continuously without breaking down, it is recommended to do preventative maintenance by a reliable company with trained technicians using original parts. In the past year, the Kyalami Grand Prix Circuit has undergone a dramatic transformation, with extensive refurbishments and upgrades to the facility. Kyalami is now the only current racing facility on the African continent that has been certified as a grade 2 – racetrack, conforming to stringent international safety and quality standards. Along with the racetrack came the refurbishment of the pit complex. The pit building has been completely revamped and is now an international convention centre, including world class facilities for all year-round conferencing, exhibitions, trade shows, product launches, private functions and activities. Folding doors are door systems that fold and slide like a concertina, resulting in a vast open space. The main benefit of these doors is that they help you save a lot of space. These doors also add to the aesthetic appeal of a warehouse or show room. There are different types of folding doors available in the market and each has its own unique set of features and benefits. What Type Of Door Does My Business Need? Doors facilitate movement and are great tools for sectioning off rooms; they serve as great barriers in areas where entrance is restricted to staff members or factory workers. There is a myriad of doors that can be used in various environments; you are guaranteed to find a door that meets your specific requirements. In this article, we will be looking at different entrance solutions, and their benefits and applications.